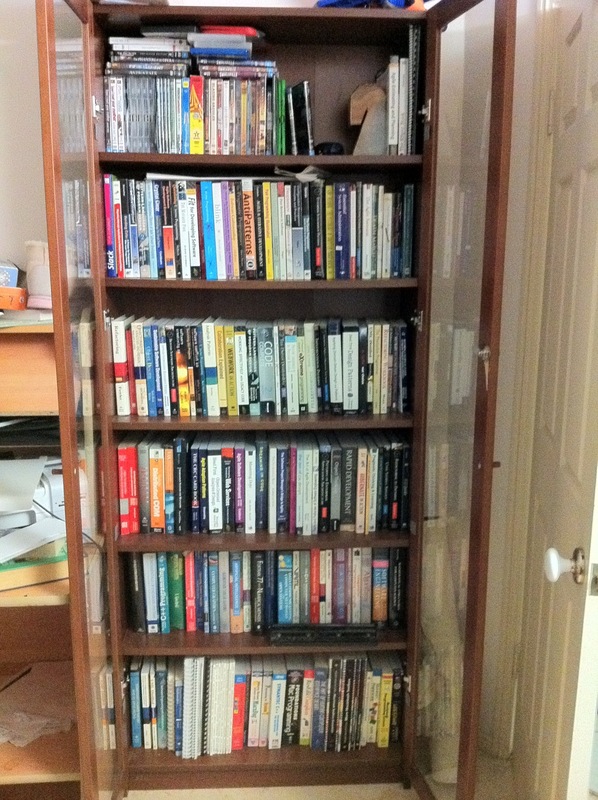 My Book Collection – Software is too expensive to build cheaply…. Well, the technical ones, anyway – not shown are the two other similarly sized bookcases – and the other one which is a little more than twice as big – which are overflowing with my fiction collection. The bottom two shelves (and a couple in the third row) are very dated – I don’t think anyone cares about the pre-OS7 Macintosh Toolbox anymore, for example. A number of the books in that row are from my university days. I gotta say, I’m thankful for ebooks – over the last two years, I’ve predominately bought ebooks. I’m not sure I could get their physical versions on the top shelf even without the DVDs (it would be another 24 books or so). Anyway, the reason I’m posting this isn’t to brag or anything – it’s to set myself a challenge. I haven’t been keeping up with my reading over the last year for a number of reasons, up to and including battling with a moderate case of depression. I’m going to change that though – I’m going to go through those top shelves and re-read (or, in a few cases, read) each on that’s still relevant – which is most of them. I mean, I’m sure Webwork In Action was great in the day, but Webwork isn’t relevant to me anymore. Age isn’t a factor, though – in that bookcase somewhere is a 2nd-printing copy of The Mythical Man Month (which I picked up in a Lifeline store for $5! ), and I’ve got both the original and the re-issue version of Peopleware in there. Then there’s the Psychology of Computer Programming – but that’s from the 20th anniversary printing. Anyway, my challenge – to myself – will be to read and post a review of the books in there. One a week, with the first review due next Saturday (October 1), with an e-book thrown into the mix every so often as well. I’ll post a full set of the books within the next few days, and I’ll even see if I can turn it into a poll of sorts in case there’s books people want me to review first. Previous Previous post: Post-Release Testing – what’s that about, anyway?